This outpost of the famed pâtisserie Meert in Lille has opened on a corner, just a few blocks from the bustle of the overly-hectic streets of the Marais. 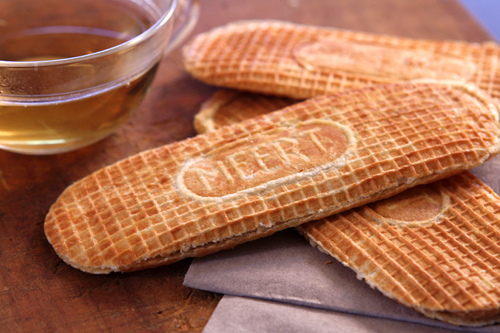 Known for their spiced Speculoos cookies, pain d’épices, and brittle pain d’amande cookies, Meert is most famous for their “gaufres”. Quite unique, these dainty, chewy waffles come sandwiched with either vanilla or speculoos cream. The shop is a bit austere, so expect understated elegance rather than opulence, a nice change of pace away from the shoppers crowding the sidewalks a few blocks away. I’m not sure how many people walking down the rue Sainte Anne, a street lined with Asian noodle bars and restaurants, would be expecting to come upon a fancy spice shop. But Olivier Roellinger handed back his three Michelin stars and expanded his Breton spice empire into this petit coin of Paris and here you’ll find a page-long list of black peppers, several varieties of fleur de sel, tubes and bottles of aromatic oils, lots of spice blends, as well as twelve grand crus of vanilla beans. But what I made a beeline for were the salted butter caramels. Sold in handy little tins for just €5, these chewy caramels come direct from Brittany, where salted butter caramel is a religion and these live up to the hype. Franck Kestener is a MOF, a designation earned by the top pastry chefs and chocolatiers in France. Expanding from his original shop in the Lorraine, the north-east part of France you’ll find goofy cannelés, a clever disguise for chocolate marshmallows, and he features a line of macarons since it’s hard to open a pastry shop without them in Paris, at this point. However I am hooked on l’Atlantique, an exquisite square of dark chocolate with crispy shortbread and gooey salted caramel layered inside. (See a pattern here?) 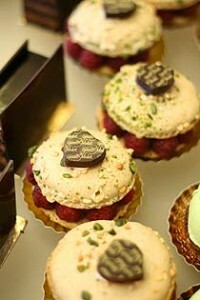 I was smitten the first time I had one at A l’Etoile d’Or up near Montmarte, which still carries them. But next time I plan on taking a stroll through the Luxembourg Gardens, I know just where to stop for something to snack on for my walk. I love Roellinger’s spices, especially one of his mix called “poudre équinoxiale”, it’s a special mix for chocolate (hot chocolate, chocolate cakes and mousses…). The shop in Cancale (Brittany) is really beautiful! Well… suspicions confirmed. Anybody who “gets” breton salty butter caramels understands basically everything. The thing is it’s sort of sad that all these great things exist in a place where you will never hear anyone exclaim, “GOD DAMMIT THIS TASTES SO FRIGGIN GOOD!” well unless they are a tourist or an expat… and the avalanche of raised eye brows will quickly temper those kind of reactions post haste. Ah… but that’s all just part of mysteries of the French. That sour puss hang dog fatalism is what drives their culinary perfectionism… if only you could separate the two. Vicki and Robin: I think the comment was meant to be make light of the irony between various facets of French culture. I don’t mind controversy but prefer if folks wish to discuss things in the comments, it be done in a manner that is enlightening and constructive. I don’t like editing or removing comments so ask that readers adhere to the Comment Guidelines when posting. The photo and the description (Franck Kestener) are enough to make me want to head to Paris immediately. Exactly the kind of sweet tooth decadence that appeals to me! Makes me think it somewhat mimics the Momofuku’s Crack Pie in bar form. 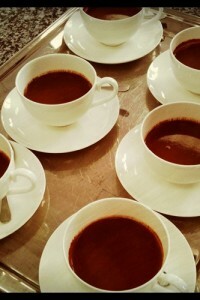 A very ‘sweet’ ending to 2010. 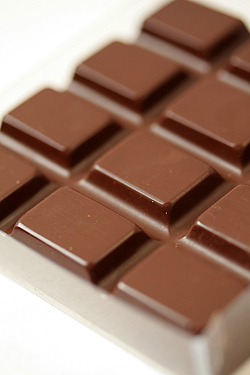 The chocolate bar looks absolutely delicious, great photo. Anyway, tremendously enjoyed reading your insightful blogs and have interesting discussions. I wish you all the very best for 2011, I hope it brings lots of happiness, good health and prosperity. And of course good eating and blogging. What a sweet way to end the year. Thank you so much for all the great recipes, inspiration, photos and information. A visit with you is always so much fun. Happy New Year to you, David. Looks amazing! I’ll definitely be dropping by Meert when I’m in Paris next month. 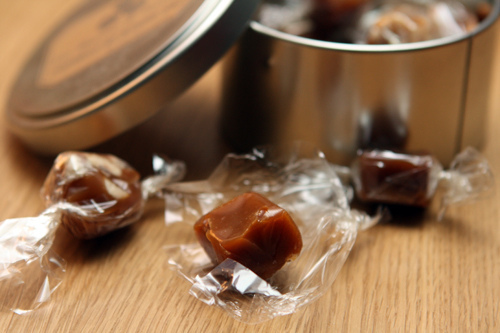 Those salted caramels will make great little gifts. Thanks! I want some of that chocolate. There. It is said. Written even. Maybe because this is the region I grew up in, but I can’t help but notice that Lorraine has quite a good crop of chocolatiers. Will you add any of these places to your tours? They sound wonderful. I’m especially intrigued by Roellingers. Oh Robin and Vicki, much could be said of the cruder areas of the U.S., and I live in one of them. So, my interpretation was Robin was poking fun at that perception, and I had a great laugh. I can just see some hearty redneck belowing Robin’s comments – to the discomfort of everybody around. And I would love to be sinking my teeth into these sublime treats, and probably be embarassing myself culturally in other ways :-). The picture of the chewy waffle looks really good and it sounds like one of those chewy round waffles that you put over a cup of hot coffee/tea for a few minutes and let the steam from the beverage soften and melt the caramel a little. Is the one in the picture anything like that? They taste better than I’m making them sound and the ones with spiced speculoos cream are quite addictive. I’m a little worried now that I’ve discovered them! Can’t say I’d ever heard of speculoos cream, though Speculoos must be related to the Dutch/German Speculas cookies, right? So, is the cream a spiced buttercream? Sounds like something I’ll have to play around with. Best wishes for a bright and sparkling New Year! 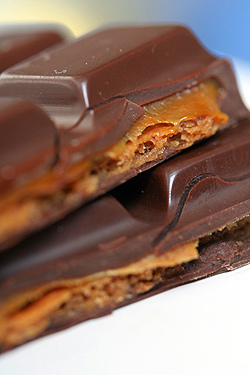 Oh goodness, I would not mind melting into gooey salted caramel as long as it is between layers of dark chocolate (pleease, make that quick, before the year is over!). I am delighted you know Manner wafers! Do you know that the wafers are still produced by the same family and right here in the city? 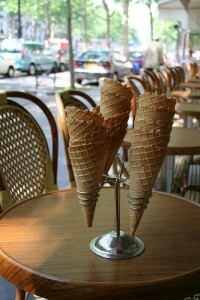 Nancy, David wrote a lovely post about speculoos on May 16, 2010 if you want to check on that. I’ve still yet to try it, but it sounds delicious. These pictures look so delectable! Three more fabulous shops to add to my next trip. Happy New Year from Belgium! Oooh! I love the original Meert (I’ve been to Lille twice and Meert… well, more than twice ;) ) so am really happy to see they now have a Paris outpost. The other two places are also going on my ever-expanding list for my next trip to Paris. Happy New Year from California (where it’s still 2010)! I was thinking that the l’Atlantique sounds quite like my favorite candy bar- the TWIX bar ( I raid my children’s Halloween treat bags to steal a few for myself.) This version, however, must be about 100 times better. The other two treats sound great too. I really enjoy keeping up with your posts. Due to working long shifts as a cheesemonger in London, I’m a little behind reading them so I’m enjoying catching up over Christmas. Due to the pre-Christmas workload I’ve neglected my own food blog (Saffron Strands) and made some hasty postings in the run-up to the New Year. I’m now inspired by you to return to more considered postngs. I’m long overdue a trip to Paris and will be sure to check out your recommendations as well as my usual haunts. The speculoos waffle sounds divine (just back from Paris where I found a jar for less than €3 – my Belgian supplies had run out). And salted caramels as well. I look forward to the day of visiting a place where caramel is a religion. My kind of place. But, I’m curious David. Do the famous Brittany salted caramels contain corn syrup? I’ve been experimenting with other ingredients lately, which is why I ask. Honey of a way to begin this new year, with a beguilement of tidbits. And your photos are their usual wonderment. Thank you for including the arrondissement in the street address. Much depends on this. Most helpful. David, I love reading of your adventures and shopping finds, but it just makes me so very envious!!! I sooooo want to try l’Atlantique, but I can’t see this being availabe in any store in downtown Adelaide, South Australia, any time soon. Your blog has been a wonderful addition to 2010 for me. Thank you. Your recipes are terrific, photos enviable, and your writing…what can I say…I really feel that I know you because of the way you write. You make me smile! Sometimes laugh out loud! Best Wishes for the New Year! Cultural differences often astound me… particularly when they are at my own breakfast table. David you have a way of cutting through the hooey and getting to the real stuff in a humorous, insightful and touching way… and your recipes rock. it’s because of you that I am now revisiting French home cooking. Tomorrow… waffles. That looks amazing! I am completely addicted your website…I am supposed to be revising for my midterms but I keep sneaking a peek at all the lovely recipes! You really do have a way of making food magical. I also got your dessert book for Christmas and have not put it down since…keep it up! Simian: There are quite a few Japanese restaurants on the rue St Anne, as well as two good Korean food markets, like Ace Mart and K Mart (which is really great). There’s also a few Korean restaurants, including a Korean bento place. They’re worth checking out. I second Kerrin’s reco to stop by Maison Larnicol–although it’s quite a strange place, smack in the middle of Odéon. Makes one hope it doesn’t become a huge chocolate disneyland for tourists, but those kouignettes do definitely look tempting! If you ever come back to Seattle (for a visit or perhaps on another book tour) you should really check out the local ice cream shop Molly Moon’s. They make a salted caramel ice cream that is positively to die for. I was never the type to pick a favourite and only eat that even when new things come out each season, but when it comes to this ice cream, it will forever hold its place as my one and only. How lucky that 3 new unique sweet shops have opened so close to you! The gaufres are about the coolest looking cookie, I’ve ever seen. I would love to taste one. I have a sweet tooth and I just love including sweet foods in my meal… I would absolutely visit Meert when I am given the chance to travel to Paris.